In this first advanced seminar following the introductory seminar, Structural Psychoanlysis and Integrative Psychotherapy (RM46), Dr. Moore shows how his discoveries can help get beyond a shallow focus on symptoms to the underlying structural deficits that issue in pathology and behavioral dysfunction both in individuals and in relationships. He explains the central role of powerful intrusions of archetypal energy in the formation of complex and symptom and shows how these intrusion lead to the particular patterns of fragmentation we note in the behavioral and cognitive presentations of patients. 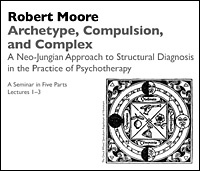 Dr. Moore addresses the way in which the new theoretical paradigm of neo-Jungian structural psychoanalysis helps make sense of the best research evidence on both the causes and the forms of psychopathology. He emphasizes the importance of structural diagnosis for adequate treatment planning.